Vintage farmhouse decor in a mobile home is a popular style but it isn’t always easy to pull it off. 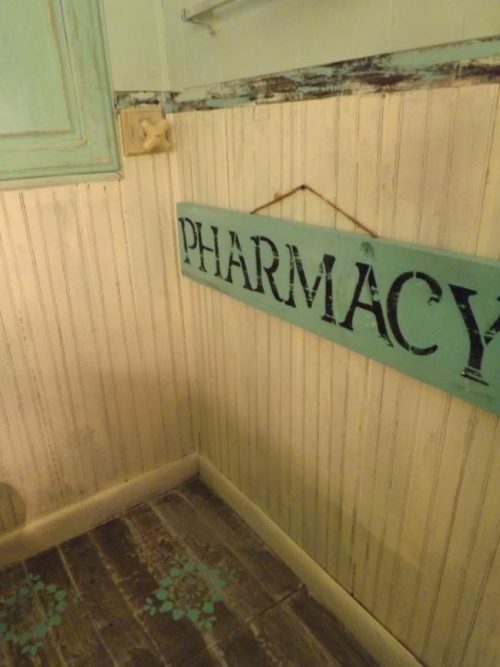 It takes a combination of antiques, repurposing, and DIY crafting to create authenticity. Lisa, from Sweet Tea n’ Salty Air, had no problem, though. She completely transformed her mobile home into a vintage farmhouse work of art. Lisa Grieco-Conforto, of Naples, Florida, lives in a 50-year-old mobile home that she inherited from her parents. It is nestled in a well-kept neighborhood where everyone owns their own land and is located just a stone’s throw from the Florida Everglades. Vintage Farm House style decorating and repurposing on a dime, thrifty and delicious recipes, lots of crafting, gardening and much more thrifty do’s. Follow along without having to purchase expensive items to decorate your homes. 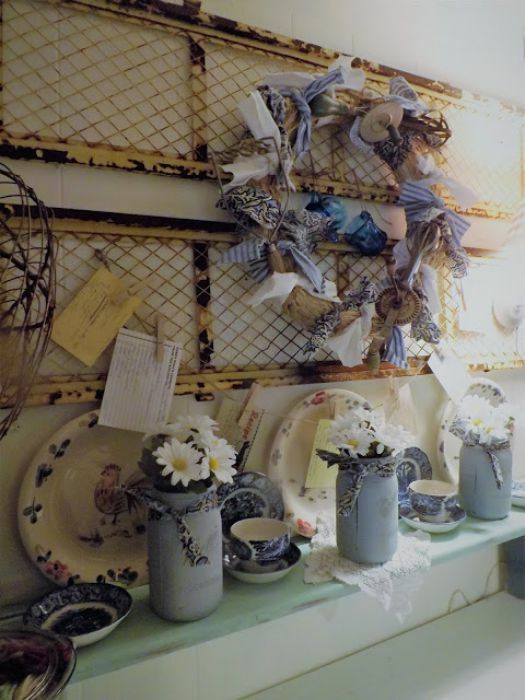 Lisa’s Handmade and Repurposed Vintage Farmhouse Decor will Knock Your Socks Off! Awesome vintage Farmhouse decor is used throughout the mobile home. One of Lisa’s favorite projects was her kitchen makeover. Lisa is an avid baker with fond memories of helping her grandmothers in the kitchen. It was important for her to incorporate her grandmother’s items that she inherited through the years. 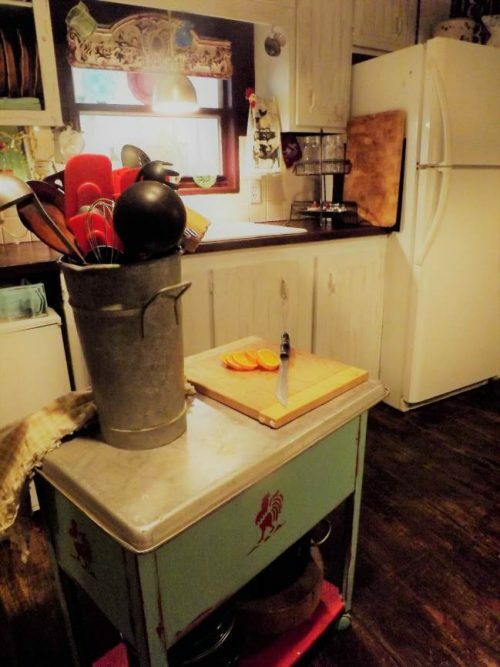 It’s not easy combining a handmade vintage farmhouse style with modern kitchen appliances and amenities but Lisa pulled it off wonderfully! Since space was an issue, Lisa put her kitchen walls to good use. She found two old metal farm wagons that a neighbor was trashing and repurposed them into rustic wire displays that hold her grandmother’s handwritten recipe cards. 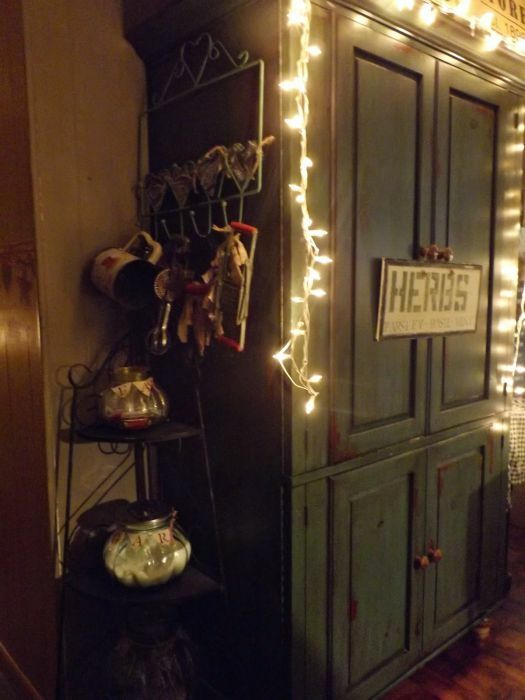 Lisa created this rustic metal wall display from a discarded utility wagon! A perfect combination of modern amenities and vintage farmhouse decor in a mobile home. 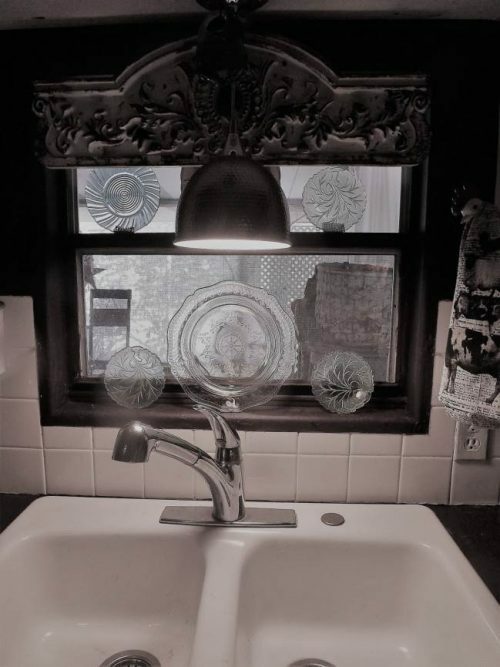 The sink area in Lisa’s kitchen is gorgeous! We have all seen those entertainment centers that have the doors that close in the tv right? To create additional storage in her lovely kitchen, Lisa bought a wood entertainment center (or armoire) at the local thrift store for $20. 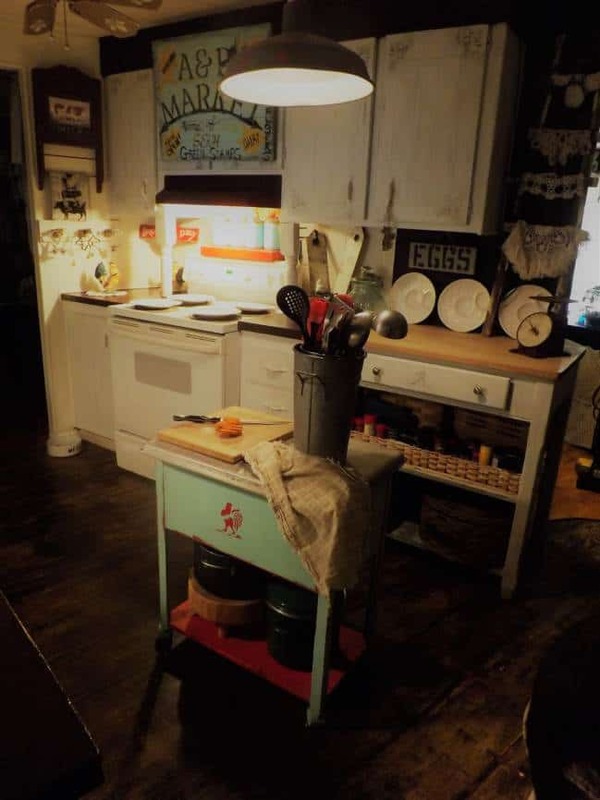 She gave it a vintage farmhouse makeover and turned it into a stylish baking center. Desert and coffee are always close at hand! You can read more about this neat project on Lisa’s blog, here. Repurposed baking center stores Lisa’s coffee maker and desert supplies. 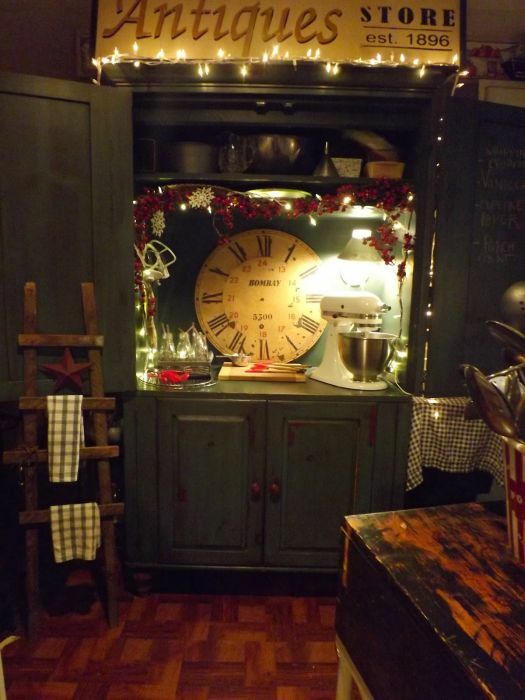 Lisa’s repurposed baking center is a perfect addition to her kitchen. Related: See another great farmhouse inspired mobile home kitchen. 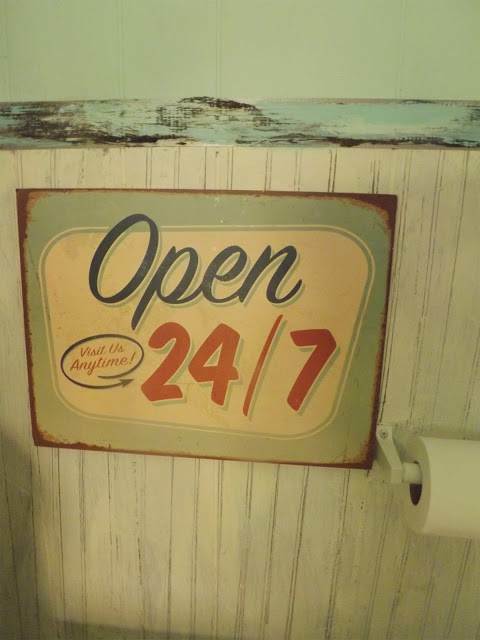 Lisa put her amazing creativity to good use in the guest bathroom. It started out as a drab brown space with no personality but it didn’t stay like that long. The bathroom is now a much livelier mix of country white and a charming greenish-blue color called Montego Bay. Close-up of Lisa’s painted bead board and duct tape trim. Painting was just the beginning of this amazing mobile home bathroom makeover. Using a painting technique and a tool she developed herself, Lisa made the bottom half of the walls look just like bead board. You can read about her technique here. Lisa then used three different colors of paint on Duct tape to create a faux wood trim for a visual divide between the country white painted bead board and the blue. 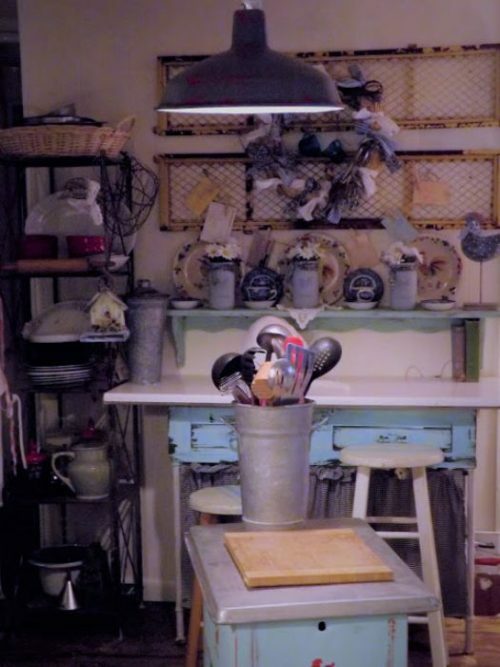 She may have used duct tape but there’s nothing tacky about this bathroom makeover! 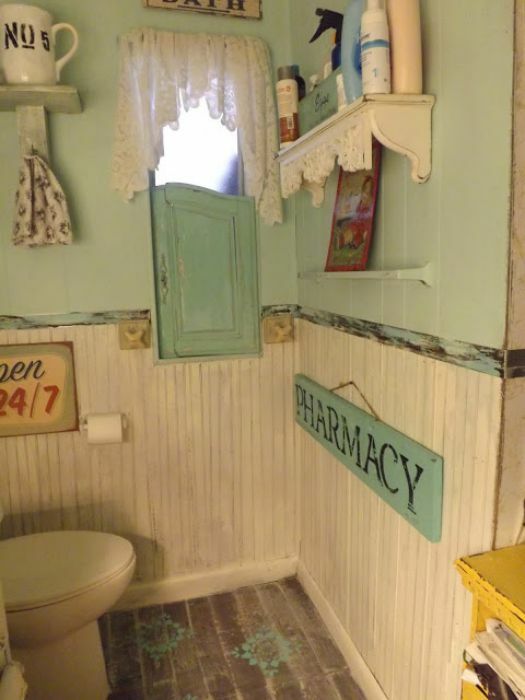 Lisa created a great country cottage bathroom using faux beadboard made from paint and fake wood trim made with duct tape! Another great project of bathroom makeover is the floor. Lisa gave the floor a worn look and added a handmade element to it with matching blue stencil art. Everything in this photo is painted to look like something is isn’t! The beadboard is made with paint, the floor was stenciled, and the wood trim is duct tape! WHAT? Bloggers like Lisa, are a real gift for those of us that don’t like spending a lot to decorate our homes. Seeing her makeover and use affordable ideas and techniques to turn the unwanted into useful items is so inspiring. 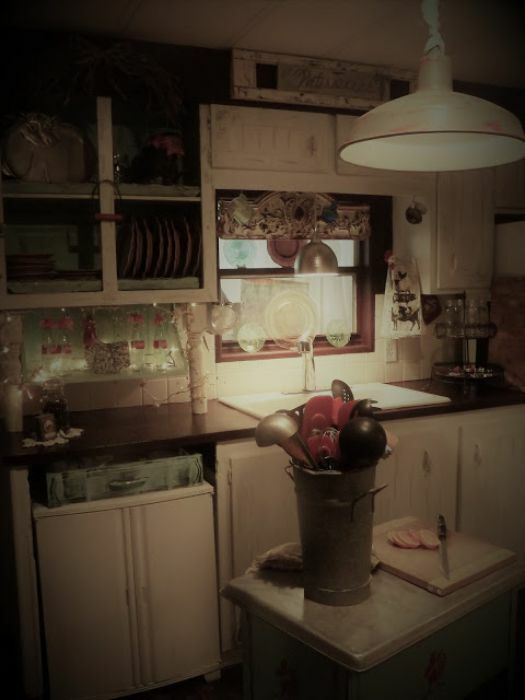 Vintage farmhouse decor in a mobile home can be a difficult style but thanks to people like Lisa we can learn what works and how to create it on a budget. Thank you, Lisa, for allowing us to share your gorgeous home! We look forward to seeing more great projects from you! And thank you for reading Mobile Home Living! LOVE this!!! It’s so smart, using what you have and getting creative! I live by this code and so happy I do. Thanks for sharing with us, you have a beautiful home!